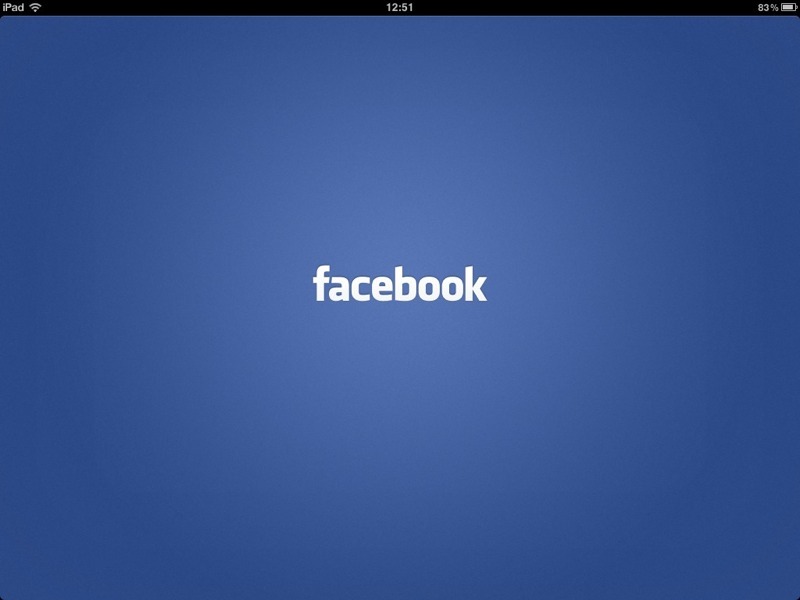 Finally and just a day before iOS 5 is released Facebook have wrangled out the long awaited Facebook for iPad. 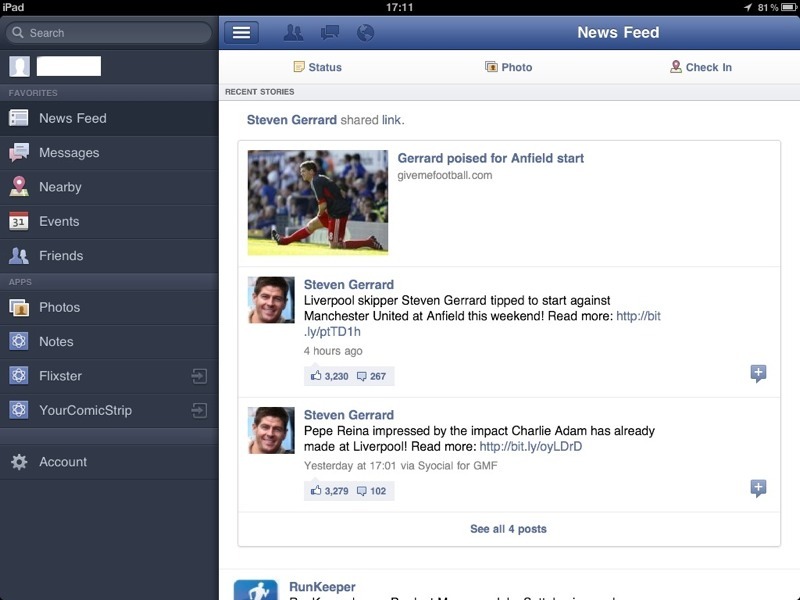 Actuality, it is a refresh of the iPhone app that also performs appropriately on the iPad. If you’ve been following my advice recently you’ll now have enabled the two factor authentication that sends a code to you phone by SMS. As with the previous version for iPhone this requires you to login twice, the password the second time is the code sent to your phone. …And we’re in. 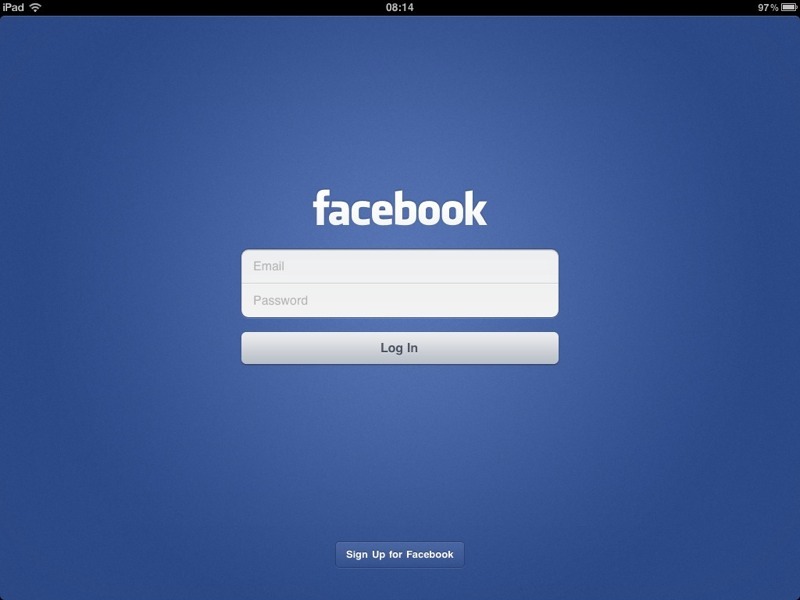 Instantly the page is recognisable as the same interface you get on almost all gateways onto Facebook these days, with exactly the same advantages and disadvantages. Mostly. The view is basically the same, based on your subscriptions but it is a little harder to control what is seen via this interface. 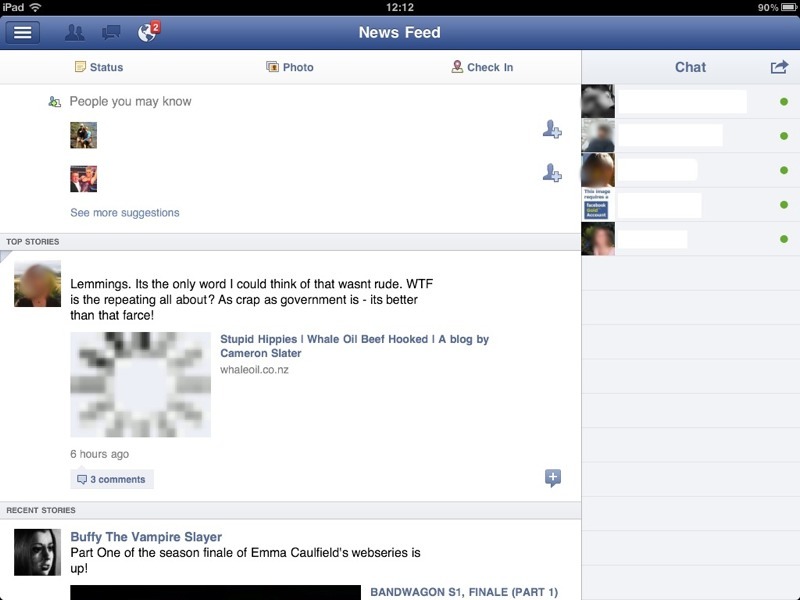 The default page is the News Feed which is what most people want and expect. No real issues here but we do have an extra little feature; a list of our currently online friends on the right. This is excellent use of the real estate available on the iPad. Please note that this is only available in landscape, portrait acts far more like the iPhone interface. In both views, portrait and landscape, you can swipe from left to right to reveal the main menu. 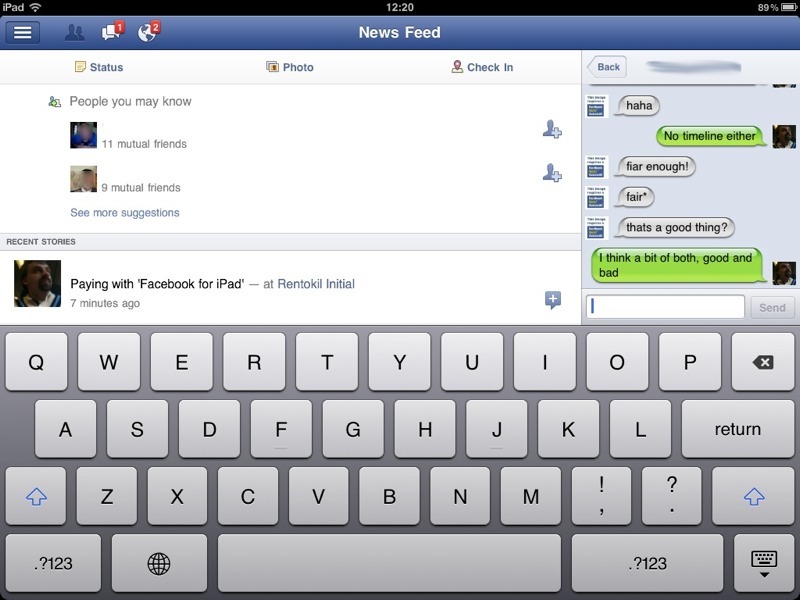 Swipe from right to left to return (and show the Chat interface when in landscape). 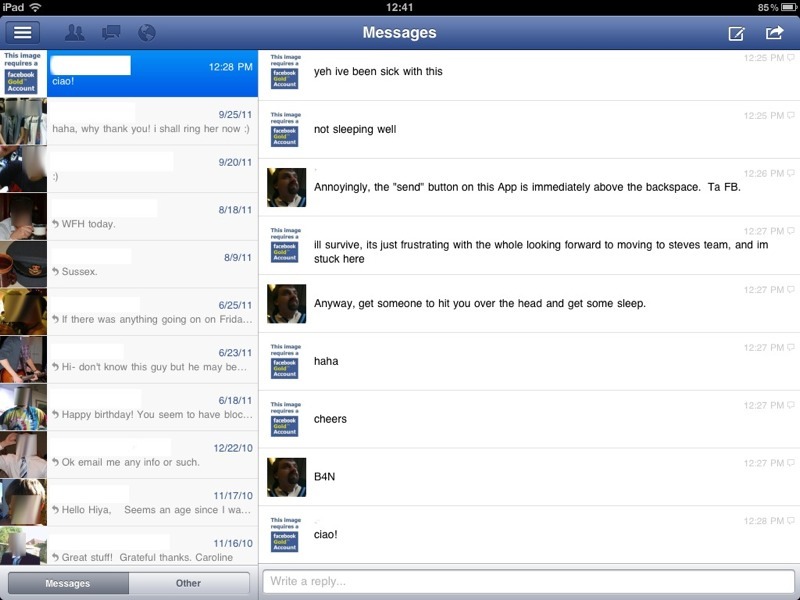 One weird feature is quite how integrated and visible the Chat and Messaging is in this App. We have the nice new right side chat, very similar to the iOS text message layout with the same bubbles design. When you start a chat though you’ll notice your Message count change by one at the top of the screen. Clicking up here gives you another method of accessing your chats. Indeed a whole new interface as an overlay, hovering above the screen below. Weirdly, this allows you to continue a conversation with the same conversation visible below. 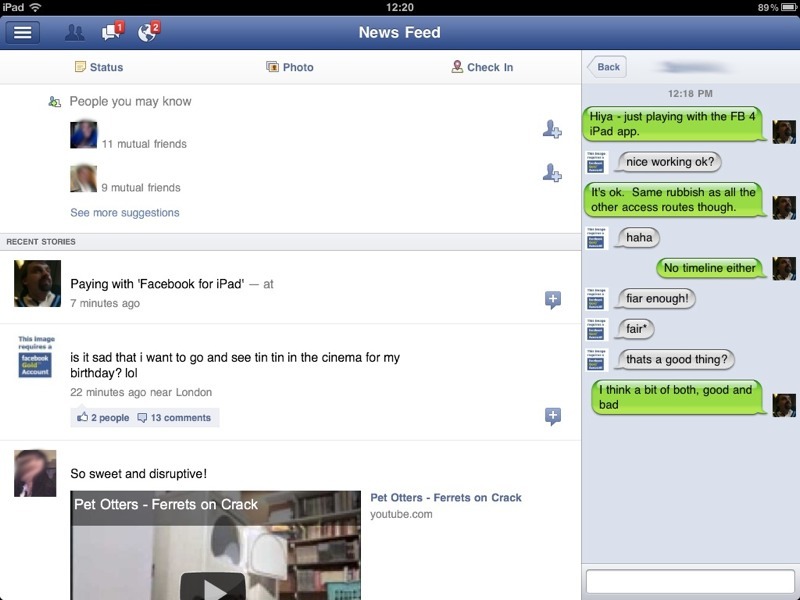 But curiously enough there is a third interface for Chats and Messages. Yep a third. From the Main Menu on the left you can select Messages and a third interface appears. 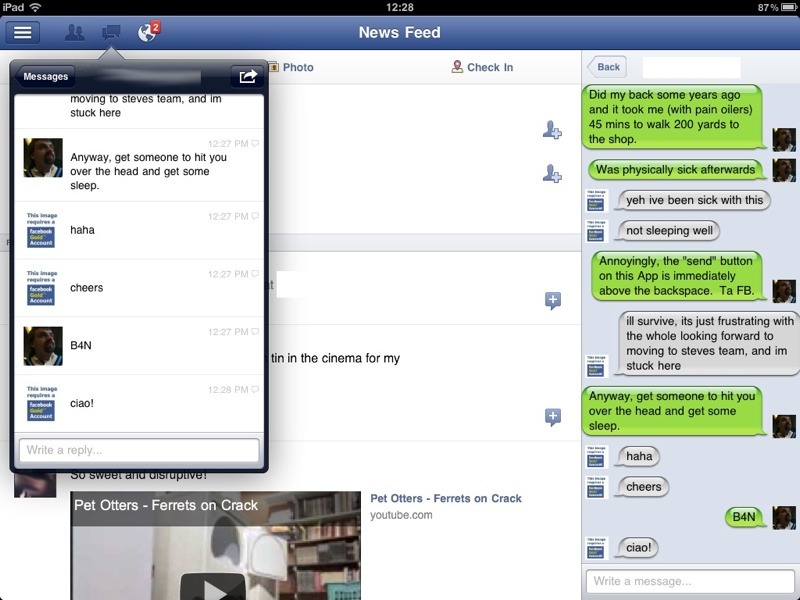 Again, bizarrely, you can activate the Messages overlay from the top menu and have the conversation visible twice. 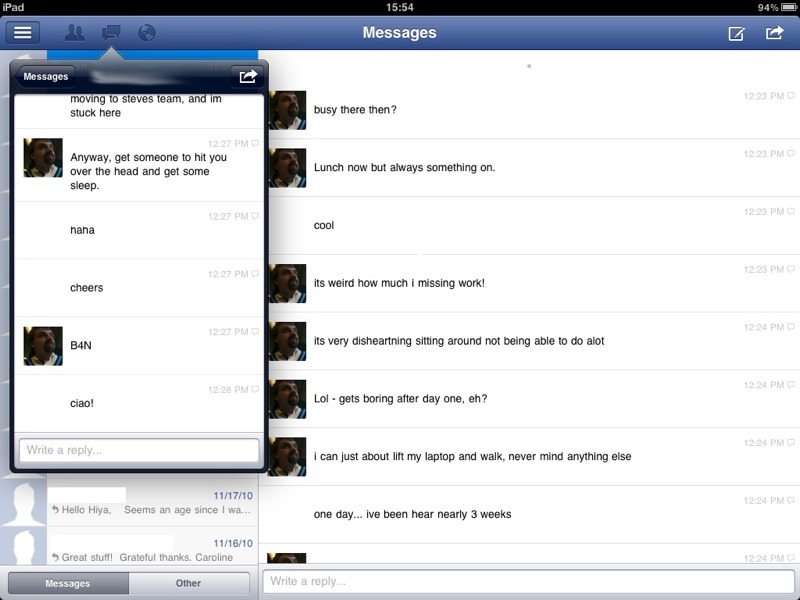 However, you can’t swipe from right to left to reveal the original Chat interface. 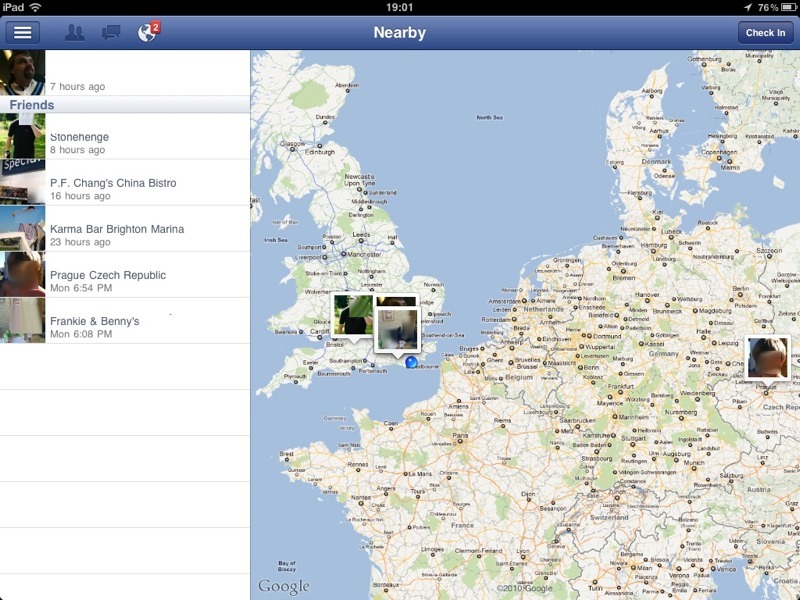 Even Facebook, it would appear, feel that seeing you message appear in realtime three times at once is excessive. Chat is responsive and the ability to wander around your Facebook environment whilst chatting a welcome and positive feature. Dunno if this is an attempt to hit at Google+ but they’ve got a new Facebook feature called Nearby, showing you recent Check-Ins made by friends on a handy map. They needn’t have bothered, from my experience of G+ – utterly useless. Now this might be of use. If you have a Facebook aware application installed on your iOS device then the Facebook app is aware of it and gives you a direct link to it from the main menu. I do use Flixster lot so that may help. There is a rumour that some games will appear int he main menu too but I have yet to see that. Obviously none of the Flash games for a start. You can’t really control your subscriptions via this interface. Pages are still hooked up to Friends, as a submenu, rather than being broken out on it’s own. The new Timeline doesn’t appear to be rendered, just the old style profiles. About time, but really all that is here is what you should expect: no more and no less. Perhaps just an attempt, success too, to get a little limelight before the Twitter fest that is sure to come with iOS 5? All the features (see caveat on right side chat) are available on the smaller device. Chat is always a little more difficult on the smaller screen and no swipe actions are available, the menu button must used instead. Chat is moved to the bottom of the Main Menu.